Add a little colour to your shirt sleeves with these Cornish Tartan cufflinks. 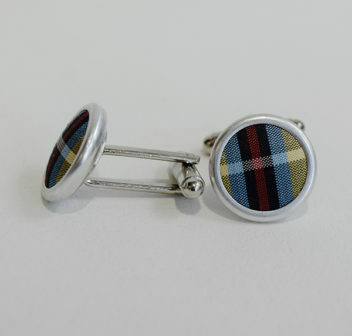 Made from silk tartan cloth and attached to stainless steel links these are a must to complete any outfit. Great for weddings,formal dinners, graduations,anywhere you need to add a little Cornishness! Presented in a black leatherette box. A little information about Cornish National Tartan – The colours of the tartan each hold a special significance. Gold for the ancient Kings of Cornwall, Black and White for the banner of St Piran, Red for the beak and legs of the Cornish Chough and Blue for the azure Atlantic Ocean that surrounds Cornwall. Cornish Tartan is also the only tartan to have its national flag complete in the pattern.